0.9 x 0.8 x 0.3 cm. Pezzottaite is one of the great new gem discoveries of the last 20 years. It is a cesium-bearing beryl species discovered in Madagascar in 2003, and is only found in three localities in the world. This material was originally thought to be a variety of beryl, but now stands as its own species. 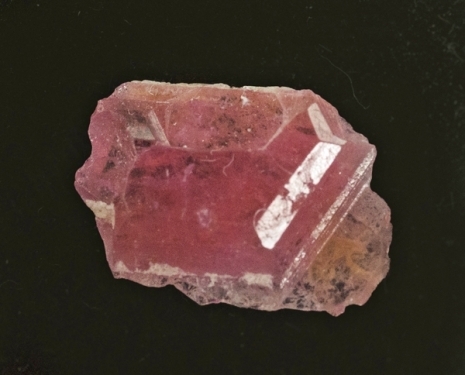 This flattened hexagonal crystal has one of the most unique colors in the gem world with a very rich, intense, rose-pink which truly doesn't resemble any other gem. No more have been found since 2005. Weighs 5.63 carats.